Two hundred years ago the first curry house was opened in Britain, by one Indian migrant who wanted to cater for those who wanted something other than the typical red meat and vegetables that were staples on the British menu. It took a long time for curry to be as popular as it is now and there were many contributions to it’s success, such as the two world wars which brought with them an influx of migrant men looking for work in our damaged lands, to renovate the bombed out eateries of yesteryear and turn them into the curry houses of today. Many of these derelict buildings were town centre dwellings, located near to public houses and places of industries and so the curry houses, once established, couldn’t be ignored and soon the post-pub curry was booming. A national poll, conducted by Chaat, the in-house magazine of the British Curry Club has found that Jalfreizi is the nation’s favourite dish with less spicy curries such as the Tikka Masala, Korma and Dhansak also making it into the top 10. From the 1990’s Chicken Tikka Masala was referred to as a ‘true national British dish’ and for generations curry has been a popular meal within our homes, in restaurants and a meal to take away. 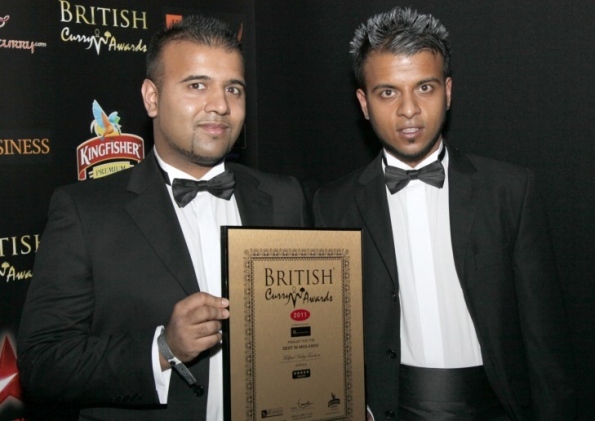 This was acknowledged with the establishment of the very first British Curry Awards in the year 2005. This is an event celebrated by many, with notable figures in attendance such as the country’s Prime Minister, David Cameron. This year there are more than 40,000 nominations split into the sectors of Newcomer of the year, Best Spice Restaurant and Best Takeaway Restaurant. The British Curry Awards are widely referred to as the Oscars within this sector, and thousands of guests attend every year. This opulent and star-studded event happens on a yearly basis, and is one of the largest and well-attended award ceremonies in the food industry. The initial objective was to spread encouragement within the younger generations to follow in the footsteps of their elders, take pride in their heritage and receive recognition for being the unsung heroes of the curry business. The awards are coveted and desired by many curry houses up and down the country, although there’s a strict screening process where all nominees are filtered out to the top 100. Those are then visited by ‘mystery’ shoppers who scrutinise everything from the service and decor to the curries themselves. Many national and international brands sponsor the top nominees with sponsors coming from curry manufacturers such as Pataks to brands such as home furnishing company The Furniture Village.